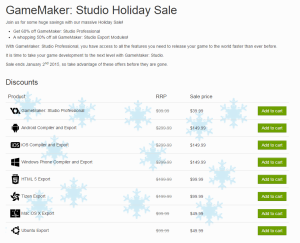 Since I was a GameMaker user I always let YoYoGames send me newsletters, I don’t particularly read most of them but one newsletter got my attention; its the holiday promo sale which offers great discounts on the GM Studio and its modules. It’s really interesting since one other reason that keeps me away from a productive work using GM Studio is that I am limited to producing executables with GamMaker logo stamped on it which no one really wants. While GM Studio: Standard (free version) is completely functional as a game development tool, it is not a good option to stay with it unless you are still learning GM, so the next obvious option is to really purchase the “Professional” version which opens up more things for you as a serious indie game developer; publish games for windows without the GameMaker logo on start-up, Full access to YYG Marketplace, ability to add platform device export modules, source control, mobile testing and other stuff that I need to know about. 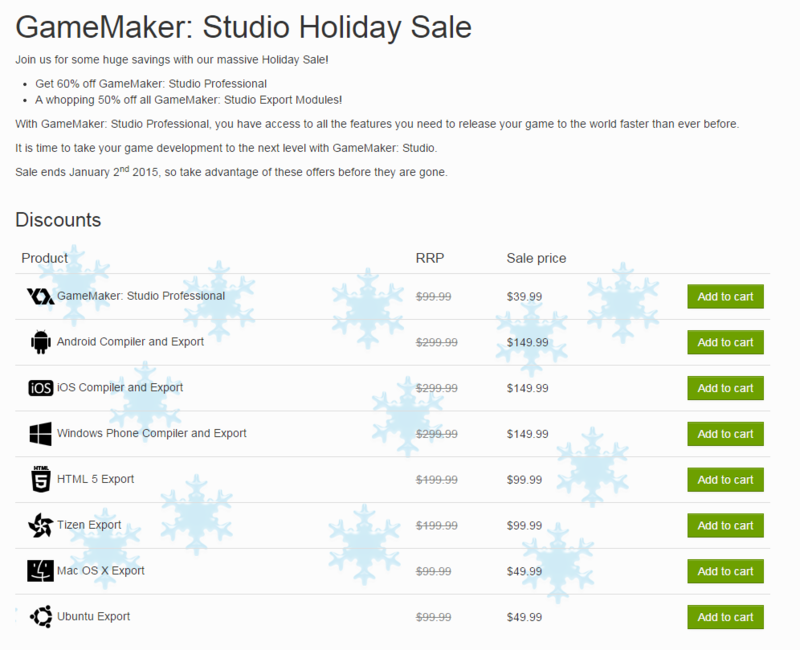 So I went to see the discounted prices and notice that Game Maker Studio Professional has a 60% off on it (39.99 US$). A really low price that is, but I still went as further as to try to use my old license (for GM 8.1) I purchased some 3 years ago to upgrade from GM Studio Standard (free version) to Professional, and guess what, it did have additional discount which makes the total price to just 15$. Now, I have GM Studio Professional and that’s a great thing to start the year 2015… may there be more GameMaker activities to come.